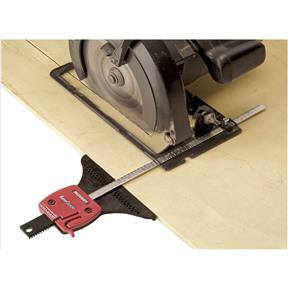 Get exceptional flexibility and precision when cutting with a jig saw or circular saw! This Milescraft SawGuide is a saw and edge guide with an exclusive trimming feature that allows you to adjust length of cut by 1/16" increments without tools. 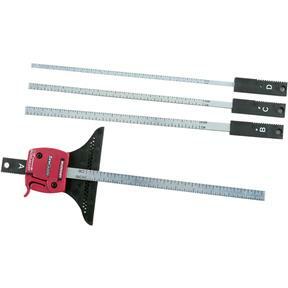 Works equally well right or left handed, and saw guide extends up to 10" from the edge of the workpiece. Includes four bars of varying widths, plus special holding clips, provides easy attachment to most saws and the innovative tooth-gear design allows tool-less exchange of bars. Multiple holes in guide head compensate for varying bar widths, ensuring precise alignment of jig's blade when cutting circles. Bar sizes are .245", .370", .485", and .585".